Approximately 60% of all amputations are preventable — resulting in 1.2 million limbs saved and 648,000 lives saved. 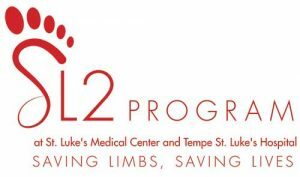 The SL2 Program at St. Luke’s Medical Center and Tempe St. Luke’s Hospital is designed to significantly reduce the risk and need of limb amputations resulting from vascular disease. By detecting vascular disease and diabetes at their earliest stages, health care providers participating in the SL2 Program work together to effectively manage and treat the diseases, and as a result, help individuals. Physicians: For inpatient consults at St. Luke’s Medical Center and Tempe St. Luke’s Hospital, refer to the Cardiology On Call Schedule.